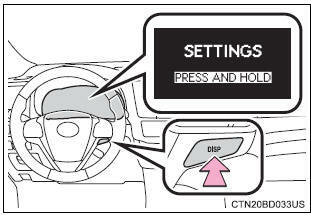 Press the �disp� switch to display the setting display while the vehicle is stopped, and then press and hold the �disp� switch to display the customize mode display. Press the �disp� switch to select the item to be set, then press and hold the �disp� switch. Press the �disp� switch to select the desired setting, and then press and hold the �disp� switch. To go back to the previous screen or exit the customize mode, press the �disp� switch to select �exit�, and then press and hold the �disp� switch. In the following situations, setting display in which the settings can be changed through the "disp" switch will automatically be turned off.